In a hotly contested race for the U.S. Senate where every dollar counts, Avalon designed innovative strategies to maximize an incumbent senator’s return on investment and fundraising results. In a state where a new Democratic governor was elected by a razor-thin margin, popular U.S. Senator Mark Warner (D-VA) took nothing for granted in his 2014 re-election campaign. Early on, the Warner for Senate campaign sought Avalon’s help to increase its impressive list of supporters and to build funds for the fight ahead. With a very modest initial 2013 test budget, Avalon was tasked with developing both re-solicitation and prospecting strategies that would inform the size and scope of the 2014 direct marketing fundraising strategy. With a limited budget and broad strategic goals, Avalon got to work with a targeting, messaging, and print production strategy that would deliver for the senator. Avalon dove deep into the campaign’s NGP donor data, identifying the most responsive segments through geographic distribution and previous contribution history. The vast majority of these previous donors had not given over the past five years, so it was crucial that we engage and reactivate them. Notwithstanding the limited budget, we also crafted an efficient prospecting list plan that encompassed donors to U.S. Senator Tim Kaine’s (D-VA) 2012 campaign, as well as progressive political donors that included the national Democratic Party committees (DNC, DSCC, DCCC), plus a compiled list of high-dollar Democratic donors. And, to micro-target the best progressive donors in VA, we created a Virginia Super Donors segment that identified donors who had made contributions to both the Warner and Kaine campaigns. It was critical that the copy strategy capture the senator’s position and voice as a statesman – his leadership and commitment to compromise and reaching across the aisle to make things happen in Washington — while noting that compromise is not a dirty word. The messaging also focused on the importance of early, foundational support along with the right touch of urgency to compel supporters to take action. And we used a response device, asking supporters to sign and return a signature card in support of the Senator’s re-election campaign. We also integrated online and offline messaging, asking supporters to provide their email addresses and to contribute online. With a tight budget, mailing efficiency was critical. Avalon designed a highly efficient direct mail format that could be easily versioned for past Warner donors, Kaine donors, or colder prospect lists. 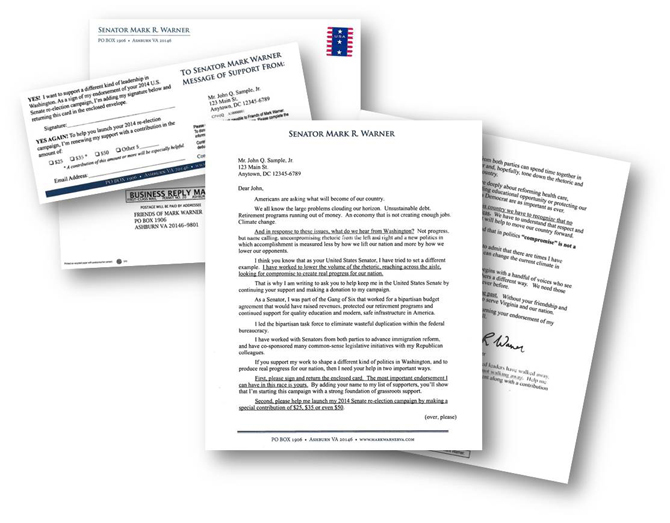 The format was straightforward and low-cost — comprised of a simple white carrier, a one-page letter, a reply device, and a business reply envelope. The results of the flagship campaign were stellar. The initial investment yielded a 300% return. Overall response rate far exceeded budget with nearly a $100 average contribution. Notably, the Virginia Super Donors segment generated an 8% response rate. As for net income, house file donors netted 85%, and perhaps even more impressive, the overall prospecting strategy netted positive income as well. Clearly, the campaign hit the right note to incentivize donors to show their early support and set the stage for a robust direct marketing program heading towards Election Day 2014. And best of all, Senator Warner won re-election!